Do you collect U.S. Medals or Tokens? 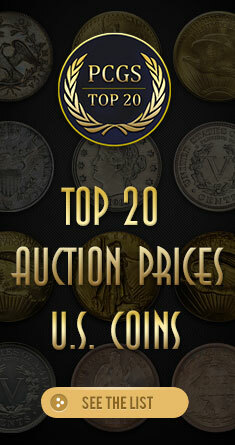 Are you aware that PCGS recognizes many different tokens and medals? Over the past couple years we have added a great many new types of tokens and medals to the list of what we will authenticate and grade. That list numbers in the thousands and crosses the spectrum of many different collecting series. Basically we will recognize any token or medal listed in a number of standard reference guides. More information is available on our website. You can also check out this week’s video for more information. Do you plan on purchasing the gold 2014 Kennedy Half Dollar Proof coin from the US Mint? How many U.S. coins have sold for over $1 million? If one posed that question in 2004, the answer would have rested at only nine. Ask that same question today and the answer is north of fifty! PCGS Director of Education Mike Sherman explains the explosion of the "Million Dollar Coin Club" and speculates on six ultra-rarities, that if sold today, would re-write numismatic history. A new composite set has been added to the PCGS Set Registry: U.S. Gold Complete Modern Set, Circulation Strikes and Proof (1980-present). This set is filled with interesting issues, including the American Arts Gold Medallions, Gold Eagles, American Buffalos, the 2009 Ultra High Relief $20, and more. Set Registry Director BJ Searls walks you through the additions and the impetus behind adding the composite to the Set Registry. Following the assassination of President John Fitzgerald Kennedy in November 1963, plans were made to memorialize the popular president on circulating half dollars. Gilroy Roberts, chief engraver of the Mint, designed the obverse. The reverse was the work of Frank Gasparro. The Kennedy half dollar captured the public’s imagination, and pieces sold at a premium from the very moment of release. Soon the premiums subsided, but despite mintages of hundreds of millions of coins, few were used in the channels of commerce. Subsequently, the half dollar became an obsolete denomination so far as everyday use is concerned. Still, large quantities were produced, although mintage figures trended downward over a period of time. In 1964, the silver content was reduced, thus making 1964 the only year Kennedy half dollar composed of 90% silver were stuck. Get detailed coin information, pricing, population reporting, auction prices realized, rarity and survival estimates and condition census on Kennedy Half Dollars with a free trial to PCGS CoinFacts. For the type collector, numismatics is full of seemingly limitless possibilities. A collector can pick and choose coins from any part of the world and from three millennia of human history. But the hardest part is staying focused, and potentially losing interest in what one is collecting. How does one make a cohesive and coherent collection when there’s just so much out there? Phil Arnold explains. Legend Rare Coin Auctions is prepping for their first sale since dropping the "Morphy" and returns to the PCGS Members Only Show at The Venetian/The Palazzo in Las Vegas for The Regency Auction VIII. This sale boasts 232 lots and some of Bob Simpson’s most sought after sets and collections.